To locate a mobile object or a person an Ekahau tag is attached to the tracked object or simply carried. Additionally, mobile computers and other Wi-Fi enabled devices can be accurately tracked using Ekahau software running in the background of the device. 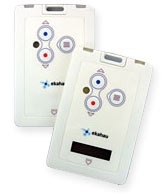 Ekahau T301A asset tag is a small battery operated Wi-Fi tag. It is small enough for tagging, yet provides multi-year battery lifetime. The tag incorporates an intelligent motion sensor and software that triggers sending the location data only when that tag is moving or has moved to a new position. This intelligence saves battery life and minimizes required network bandwidth. T301A can be attached to an asset by double sided tape, industrial Velcro or tie wrap around loops of the tag. Additionally a multi-purpose mounting plate and a special mounting plate for hanging. Ekahau T301B Rechargeable Badge is a credit card sized rechargeable Wi-Fi tag. It is ideal for personnel tracking, or for tracking assets that have a power source that can be connected to the tag for a continuous power feed. T301B can be recharged with a single personal charger or with a rack-charger for 10 badges at the time. The tag features an intelligent motion sensor as with the T301A tag, pull switch for activating alarms in case of emergencies, call buttons, and an optional text display for sending and receiving short text messages.